My last picture on Hammarby Sjöstad (Hammarby Sea City). 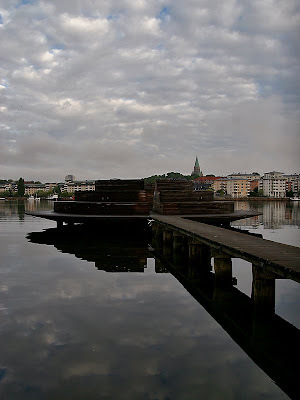 On this picture you see "Observatorium", a sculpture and bathing platform, with Södermalm in the background. The clouds reflected in the water make this a nice composition. Himmel både under och över, ser närmast ut som ett skepp som svävar i rymden.